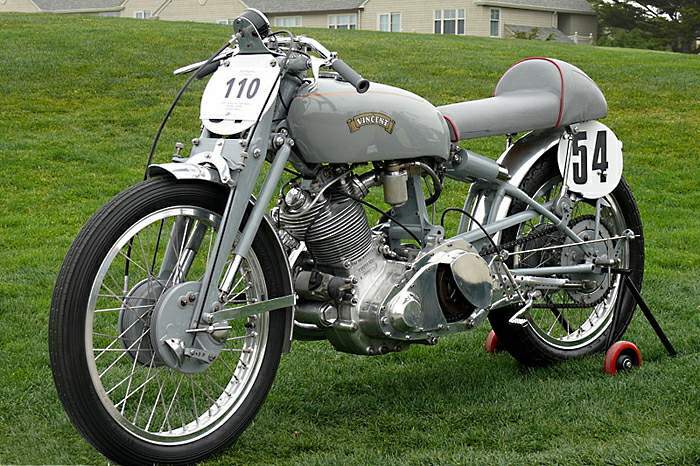 1950 VINCENT "GREY FLASH." Apart from entries from A.J.S. and Norton, up to the middle fifties, the Senior T.T. entry jjsts have, with one noteworthy exception, been completely avoided by British manufacturers since the war. 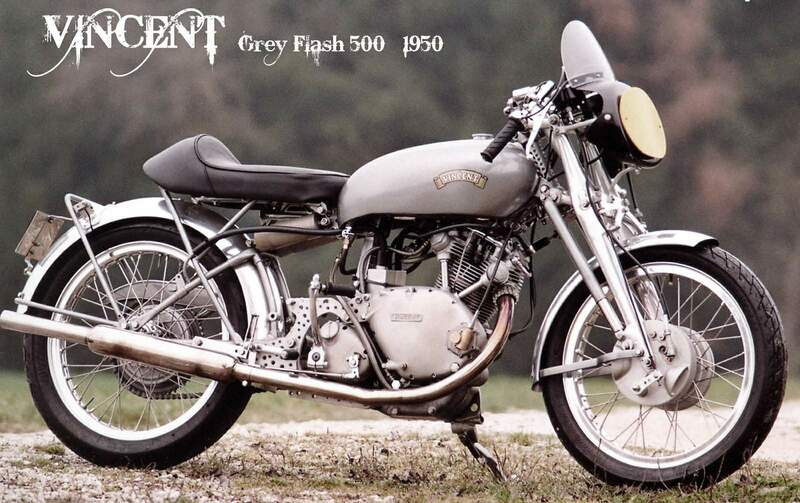 The exception to this unfortunate "rule" was made by the Vincent works of Stevenage, who, in 1950, had the courage to enter a team of three riders on almost standard "Grey Flash" models. It took courage to do this, for the Vincent 500, with its push-rod motor, was basically intended as a luxury touring model, the "Comet". Pre-war, Vincent's had built a 500 c.c. engine with a high camshaft and short "crossed" push-rods. This machine, in one form, was sold as the "Comet". Then, in 1936-37, the Australian genius Phil Irving, who had designed the "Comet", designed a 1,000 c.c. Vee-twin, employing two "Comet" engines. As it was intended to go quickly it was named the "Rapide". During the war period, and shortly afterwards, the "Rapide" design was cleaned up so that it lost its nickname of "plumber's nightmare" and all the external oil-feed pipes were done away with. The new engine was in unit with Vincent's own clutch and gearbox (the clutch had been the weak link in the pre-war big twin). The Series B "Rapide" was launched in 1947, and soon afterwards Vincent's did the opposite to their pre-war effort—they halved the big twin to make a 500 c.c. single, the new-type "Comet". This had a similar bottom half to the 1,000 c.c. engine, with an impressively sturdy crankshaft assembly, but a separate Burman gearbox was employed to cut down costs. plates encircled the gearbox and supported the rear swinging-fork, whilst Vincent's patented "Girdraulic" fork was used at the front. As was expected, the "Grey Flash" entries didn't win the 1950 T.T., but they did lap surprisingly quickly, their best efforts being in the 84 m.p.h. region. A young apprentice at Vincent's made one go very well in short-circuit events; his first win was on one at Boreham in August, 1951. His name was John Surtees. Engine: single-cylinder 500 c.c. o.h.v. ; valve operation by high camshafts and short push-rods.